The 9th Directive was first published in the UK in hardback by Heinemann in 1966, under a dustjacket designed by Tom Simmonds (featuring a front cover photo by the almost identically named Thomas Simmons, natch). 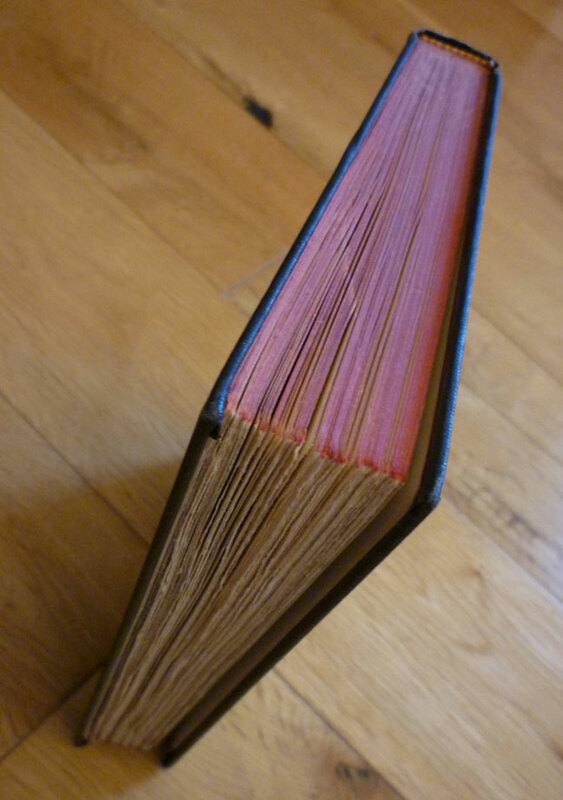 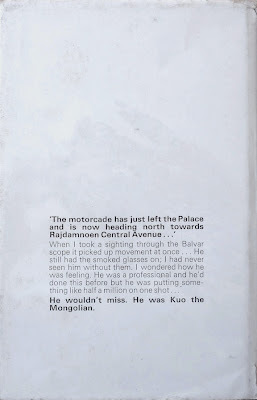 It is, as I say, the second of Trevor's Quiller novels – although actually the third novel written under the Adam Hall alias (the first being the 1963 Quillerless outing The Volcanoes of San Domingo) – and sees our surname-only spy engaged in a duel with the colourfully monikered Kuo the Mongolian. 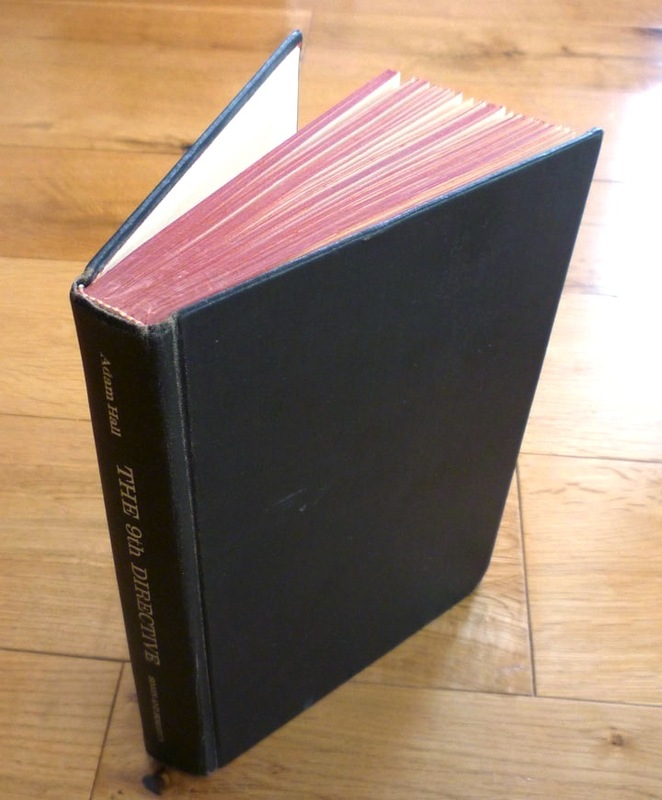 I've yet to read the novel, but I have read its excellent 1965 predecessor, The Berlin Memorandum (a.k.a. 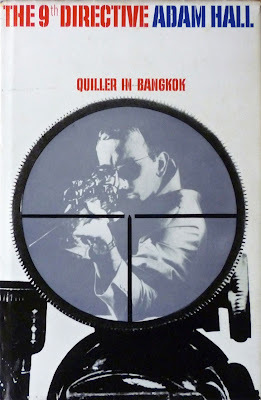 The Quiller Memorandum), my review of which can be found right here. 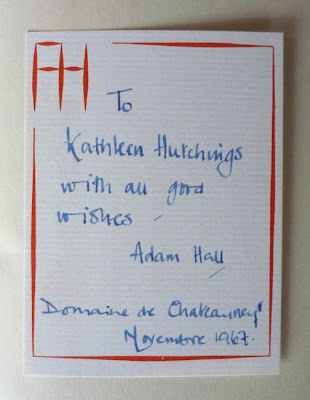 An Adam Hall bookplate, signed and dedicated by Trevor as Hall, and addressed from Domaine de Chateauneuf, near Nice, where Trevor lived until 1973 – although I believe he kept his house in France even after moving to America (correct me if I'm wrong, Quiller aficionados). 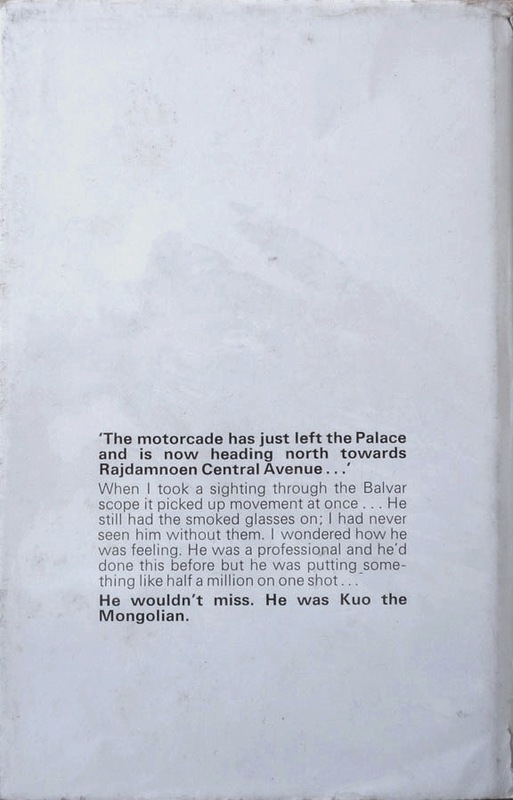 And it's contemporaneous too, as evidenced by the "Novembre 1967" date. I spotted this copy of The 9th Directive tucked away on Amazon Marketplace, and didn't have to pay through the nose for it. 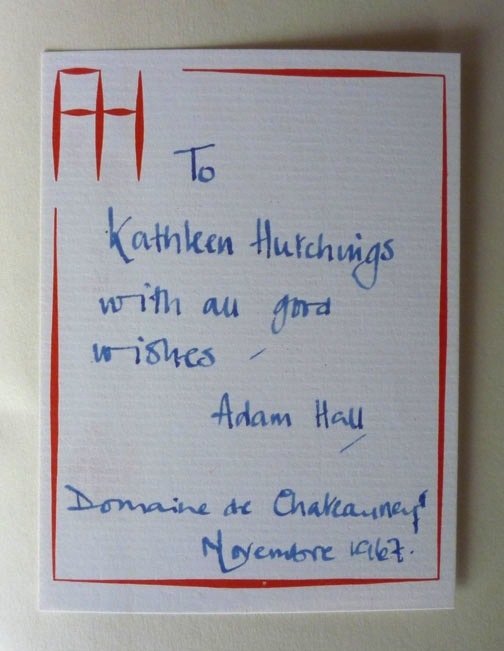 Which was something of a surprise, as there are currently only eleven signed Adam Hall books on AbeBooks, just five of those being Quiller novels (the remainder largely comprising reissues of the novels Trevor wrote as Simon Rattray – which were reprinted as by Adam Hall in the 1970s – along with a couple of copies of his 1979 horror work The Sibling). 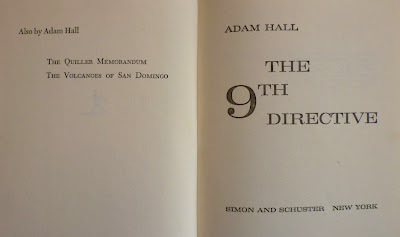 And among those five, The 9th Directive does not appear. 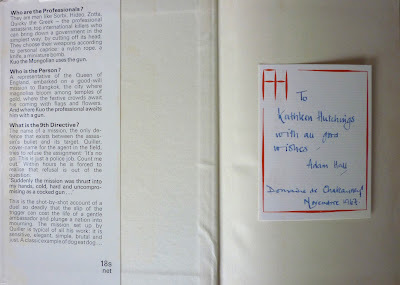 The closest comparison would be the signed first edition of The Berlin Memorandum, which is on sale for £225 from the States. 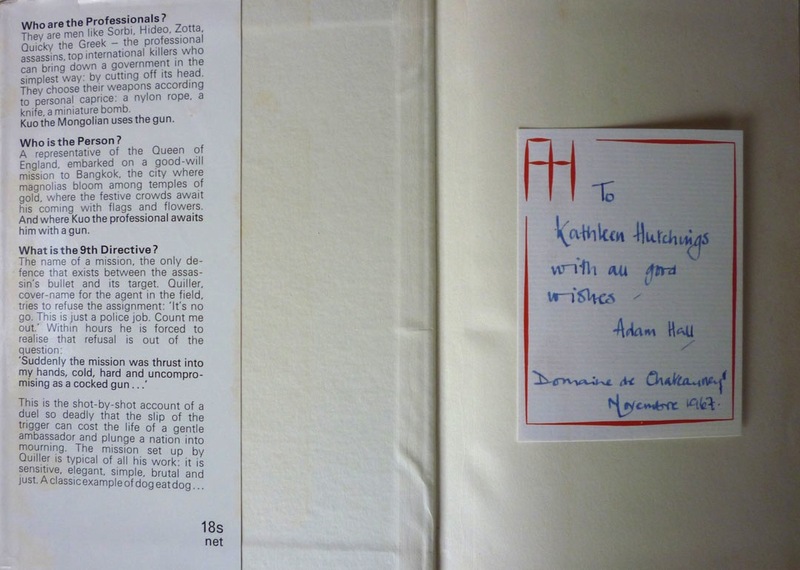 So your guess is as good as mine as to the value of my copy of The 9th Directive.